Driving north from Hyères, our first stop was the Plus Beau Village of Tourtour. Nicknamed le village dans le ciel de Provence (the village in Provence’s sky), Tourtour has wonderful views over the valleys and a cute, café-lined main street that reminded me of Mougins. Next we headed to Seyne to spend the night chez our friend Guy. 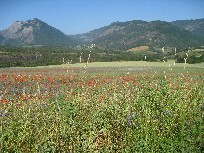 We drove through part of the Gorges du Verdon (one place in Provence that we never got around to visiting) and, later, endless fields of poppies and other wild flowers. Lunch the next day was a picnic in Barcelonnette, followed by a major map error that added two hours to our trip. Finally arrived in Risoul, where we stayed for three nights. We visited Briançon and another Plus Beau Village, Saint-Véran – at 2,040 meters in altitude, it’s the highest commune in Europe. 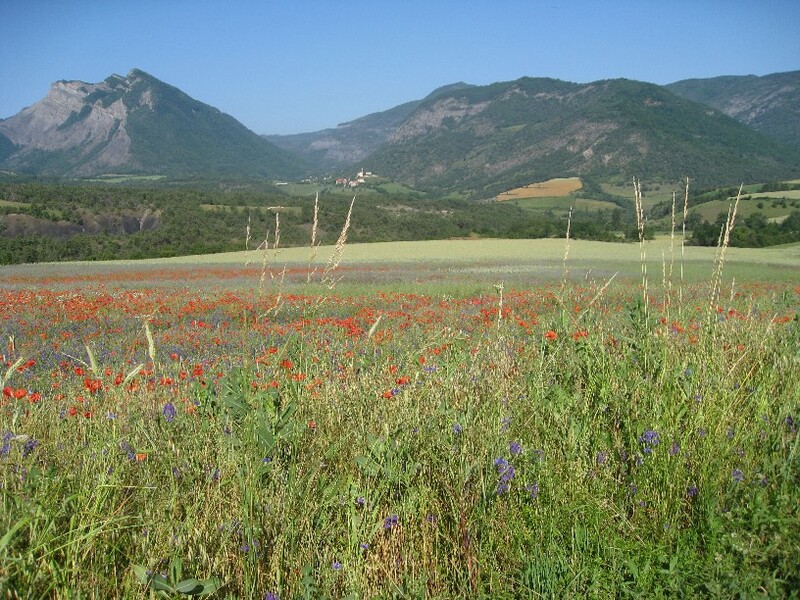 Upon leaving Risoul, we drove to La Mure and took the little tourist train to Saint-Georges-de-Commiers, round trip. 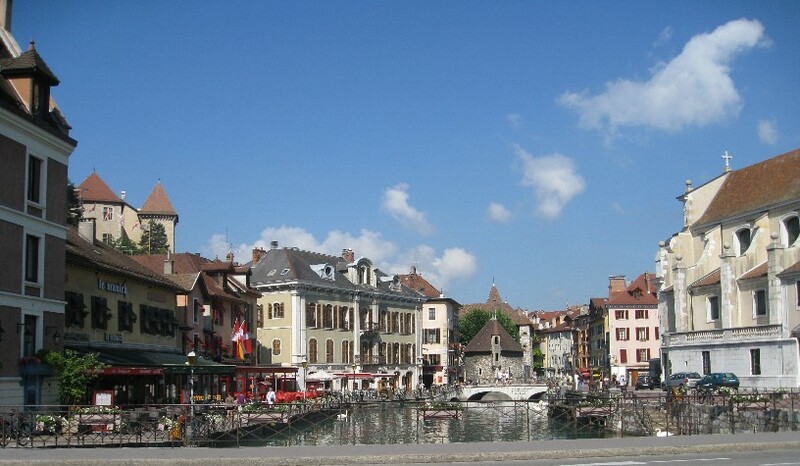 Continued north and arrived in Annecy, where we stayed for two days. We enjoyed a lovely day of biking and paddleboating and could easily have stayed a week. Truly a lovely city, and one of the most beautiful lakes I’ve ever seen. Unfortunately, my husband lost his wallet with his license, credit card, and, as far as we can remember, about 200 euros. Two more Plus Beaux Villages: Sixt Fer à Cheval, which was cute but unremarkable – though definitely worth the visit for the beautiful drive, and apparently it’s a favorite spot for hikers. 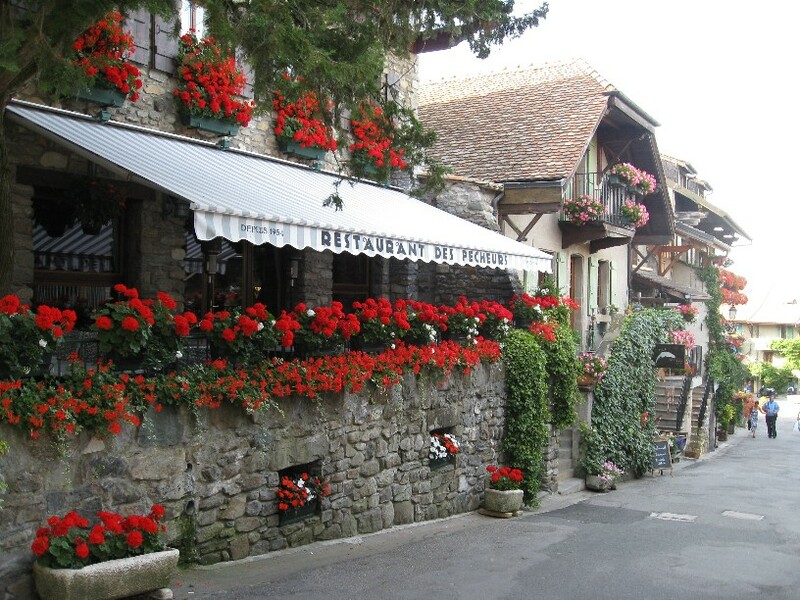 Then Yvoire, which was like a town-sized flower shop – it seemed to be filled and covered with flowers as far as the eye could see. We spent night number 7 in Amphion-les-Bains, on Lac Léman (Lake Geneva). it’ll be a fascinating voyage definitely. i wish do a same tour when i learned enough french (i’m learning from you by your newsletter now!). Hope this day not too long to come! I have been reading about your travels. What did you do when your husband lost his wallet, etc.? Laura, you never cease to amaze me. What a trip and kudos for your great reports. I flipped when I saw the photo of Honfleur. My wife loved that village especially one particular jewelry store. We were on a cruise ship which was to sail at 5:00PM. We were told that there were “lots” of taxis in Honfleur so we stayed after the cruise bus went back to port at midday. We lost track of the time and then realized we had to get to the port pronto. Not a taxi in sight! The tourist bureau told me that there only a few taxis in town. In desperation we went to the bus terminal to get a bus going close to the port. Lo and behold a taxi pulled up. The driver remembered seeing us earlier. He absolutely loved it when I spoke French to him.We made it to the ship just in time. Je l’ai échappé belle!! !